As the weather begins to turn colder, it’s the perfect opportunity for a warm and filling bowl of soup. 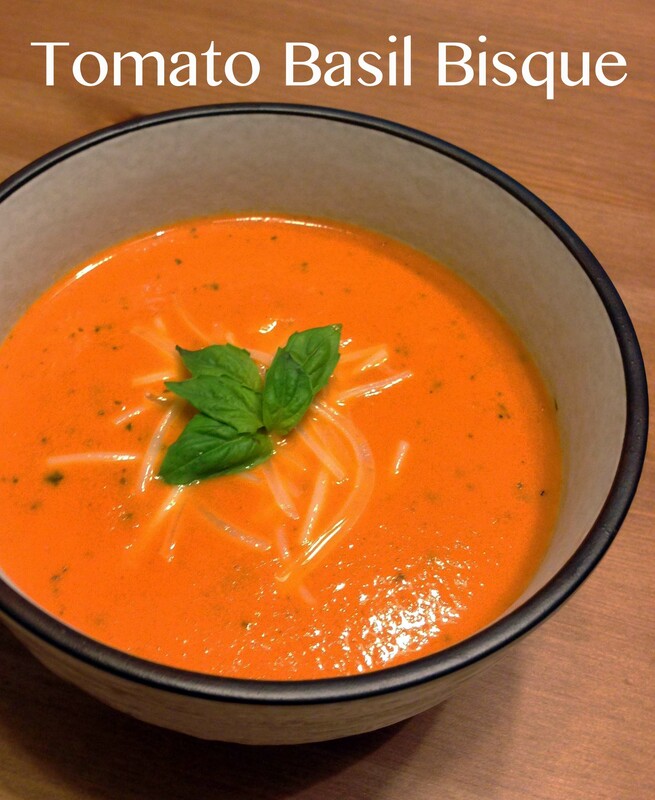 Here is one my new favorite Fall recipe for the season: Tomato Basil Bisque. I’ve adapted a recipe I found on Shared Appetite’s Blog. A Dutch Oven is my favorite vessel for making hearty soups. But if you don’t have one, feel free to use any heavy bottom pot. I do love cooking with a Dutch Oven though (especially since my apartment has an electric stove), because it allows to get even heating in order to get the yummy brown bits that form whenever I’m sautéing. After, I cook the onions and garlic, I move the ingredients to the side of the pot so that the brown bits are exposed in the middle of the pot. Then, I pour the chicken stock over the brown bits to help release the pieces. Look at that bubbly goodness. Since I’m using a can of whole tomatoes, I like to crush them up a bit in the can so that I’m not fishing around in the pot trying to smash the tomatoes up against the side of the pot. In order to prevent spilling the sauce all over the counter, I pour a bit of the sauce into the pot first and then smash away. You don’t have to go crazy and pulverize all the whole tomatoes, I just crush them enough so that each tomato is smashed into 3 or 4 pieces making it easier to puree later on. I also add the shredded basil to the soup concoction before I puree it, but feel free to add the shredded basil after you puree the mixture. This soup can be tailored to your personal preference. Hope you enjoy this nice, warm winter soup! Heat Olive Oil over Medium heat in a dutch oven. 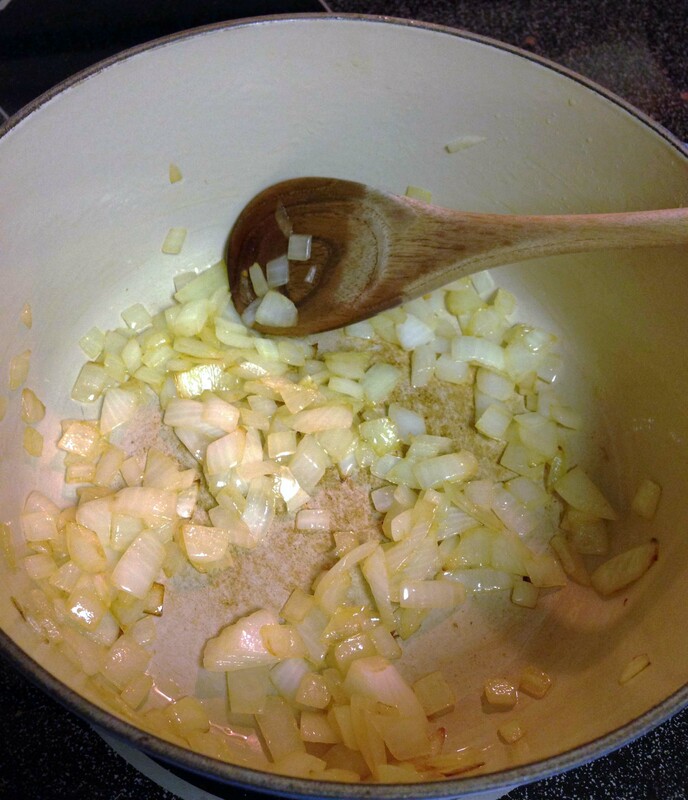 Once the pot is hot, add onions and season with salt. Cook the Onions for about 15 minutes or until they turn translucent and golden brown on the edges. Add the minced garlic and cook for about 1 minute. 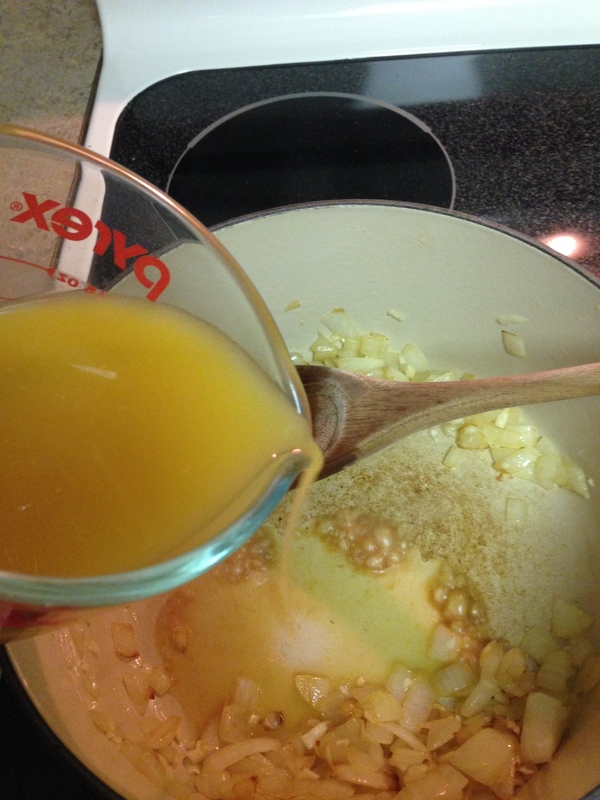 Continuously stir the pot so that the garlic doesn’t stay in one spot for too long and burn. Move the garlic and onion mixture towards the edge of pot so that the brown yummy bits are exposed. Pour in the chicken stock over the brown bits and stir so that you pick up all the brown bits on the bottom of the pot are mixed into the chicken stock. 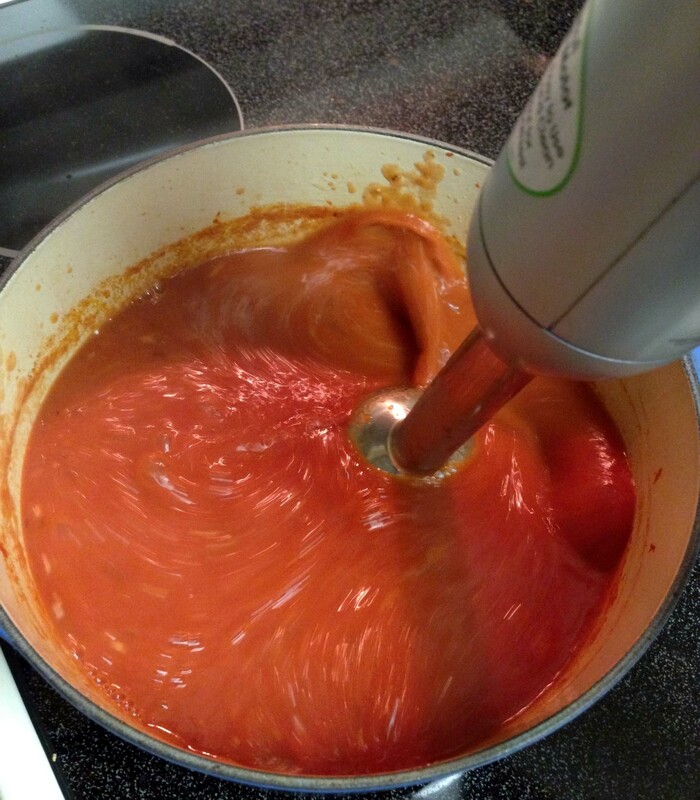 Pour your can of tomatoes into the mixture. 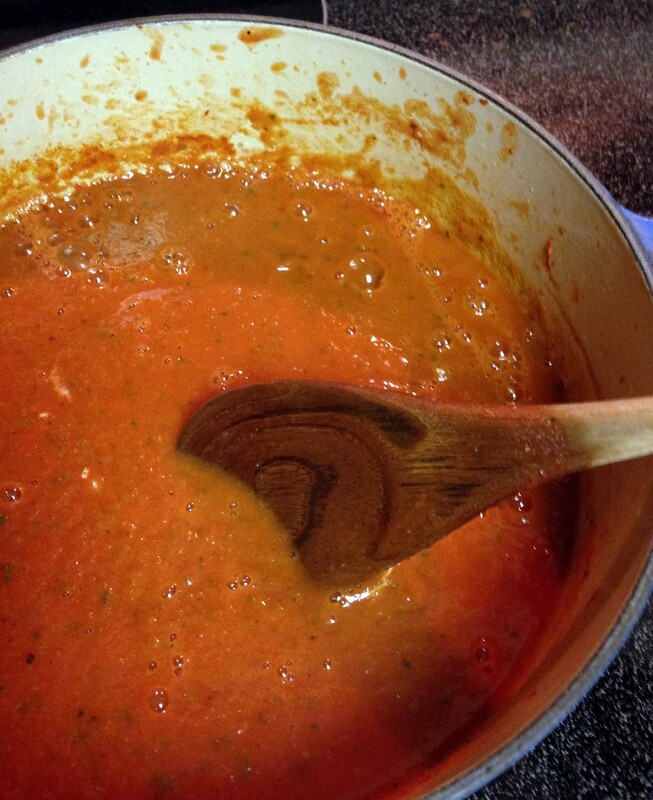 If you’re using a can of whole tomatoes, I like to pour a good portion of the sauce into the soup mixture and then gently crush the whole tomatoes in the can. 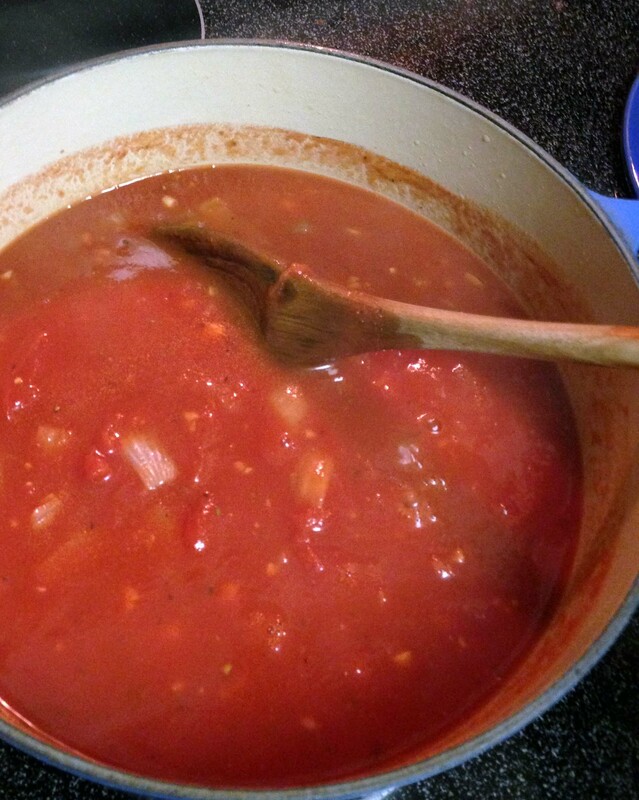 Once they’re crushed, pour all of the crushed tomatoes & sauce into the pot and season with salt & fresh ground pepper. Bring the soup to a boil, and then lower to a simmer. Cover the pot and let the soup simmer for about 15-20 minutes. Add the handful of basil and then use the immersion blender to puree the soup. 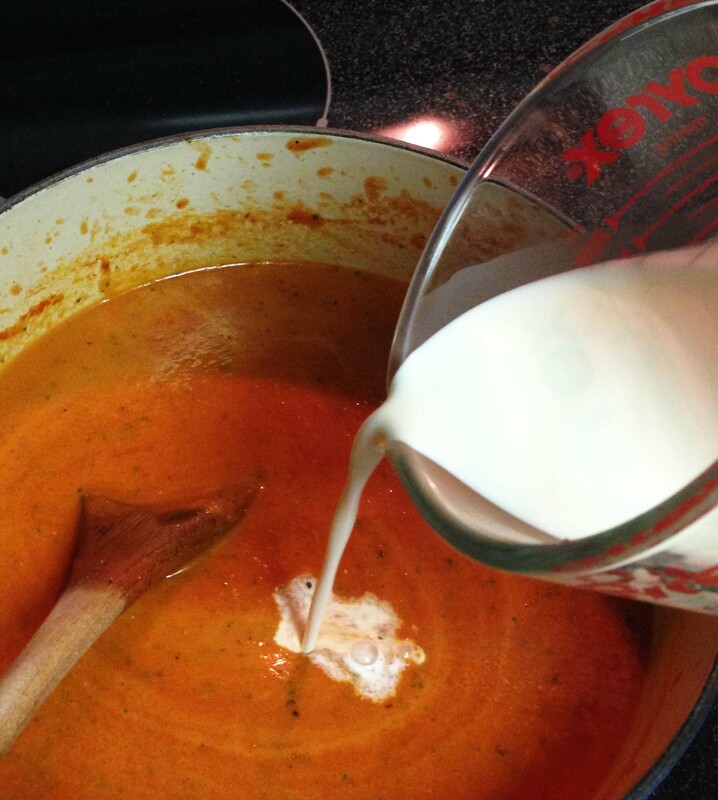 You can also use your blender and puree your soup in batches. Once, the soup is pureed to your liking, gently stir in the cream. If desired, you can a handful of shredded parmesan cheese to the soup now and simmer for another 15 minutes or until the soup’s thickness is to your liking.